Our shrimp are sold fresh from our boat. 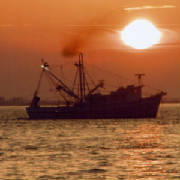 Please email us to see what size shrimp we are catching today! Be a member of our crew! Coming soon Christina Leigh Shrimp Company T-Shirts and Hats.